Automobile fumes contain certain poisonous chemicals, including carbon monoxide, sulfur dioxide, nitrogen oxides, formaldehyde, benzene and soot, which can be harmful to the human body if they are regularly inhaled in large quantities. Although such preferences are irrational and a bit strange, some of them are much more than that. For example, smell (which in effect becomes inhalation) of car exhaust is extremely harmful to the body. In the most extreme cases, it can kill people exposed to high doses. starting the vehicle. 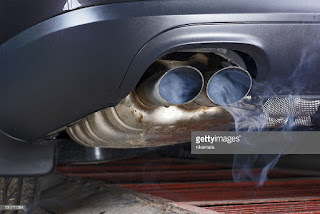 Everything that happens under the hood of the car (mainly fuel combustion) releases the mixture of gases and suspended particles, which we collectively describe as exhaust gases. Exhaust gases cause most of the emissions of an automobile because it is released mainly as a by-product of the combustion of certain fuels such as diesel, gasoline, natural gas, fuel oil, etc. The exhaust gas of a vehicle is removed from the car and released in the environment through a so-called exhaust pipe or motive nozzle. Exhaust gases are known to be unhealthy to humans and the environment because of the presence of certain chemical substances that are known to be harmful to humans. It should be noted that not all components of the exhaust gases are harmful. They also consist of non-toxic components such as nitrogen, water vapour and carbon dioxide (although this is a greenhouse gas and makes a significant contribution to global warming). But before we go into detail about the gases and their effects, we will make a list of these gases! No discussion of the emanations of the car and its dangers can be complete without mentioning this dangerous gas. Carbon monoxide is in itself a colorless, tasteless and odorless gas. It is one of the main culprits responsible for exhaust fumes dangerous to human health because it binds to the hemoglobin of our blood, which causes suffocation. In case of constant exposure to a minimal amount (0.0035%) of carbon monoxide for 6 to 8 hours, the first symptoms of carbon monoxide poisoning begin to appear: dizziness, confusion, sore throat and head-ache. This becomes increasingly serious as the concentration of gas in the air increases. At the end of the spectrum of its adverse effects is the person exposed in less than 3 minutes, if its concentration in the air is 1.28% (12,800 ppm) or more. Exhaust pipes contain certain hydrocarbons (compounds containing chains of hydrogen and carbon atoms), especially benzene, which have dangerous consequences for our health both immediately and in the long run. As a well-known carcinogen (something that causes cancer), benzene is known to suffer from bone marrow, which can lead to a reduction in the number of red blood cells, leading to anemia. A colorless gas with a sharp smell, sulfur dioxide irritates the respiratory tract, including nose and throat, causing wheezing, coughing and breathlessness. In the long term, long-term exposure to sulfur dioxide has been associated with asthma and other similar conditions. The harmful effects of soot are too numerous to mention, but include flu, asthma and even cancer. Soot inflicts an unpleasant blow to the respiratory organs of people who are constantly exposed to it. It is also associated with acute vascular dysfunction and an increased risk of coronary heart disease. In fact, soot is so harmful to the environment that it accounts for more than a quarter of total dangerous air pollution!